Informed by the real-life fallout of the U.S. economy and devastation caused by multiple hurricanes along the southern coast, In the Shadow of Evil tells a modern day story involving the exposure of a building rebound scam. Amidst the layers of unethical practices, supply shortages, and excess murders, a top Louisiana homicide detective loses his heart to a charitable contractor while uncovering a secret about his tragic past. 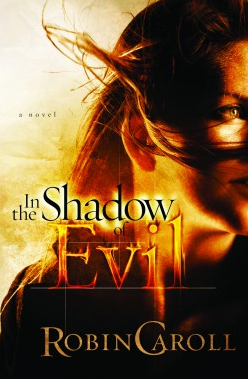 In the Shadow of Evil was my first book by Robin that I have read and I will most definitely be reading more from her! This book was enjoyable from start to finish; not one boring part in it. The plot was definitely well thought out and original. I wasn’t able to tell who the killer was for some time. Actually, it took me until a few hundred words before the killer was revealed to figure it out. The characters were believable, as was their feelings. Detective Maddox Bishop was my favorite character. Robin definitely has a knack for writing compelling romantic tension. many times, I get bored of romance because it doesn’t feel genuine. Happily, the relationship between Layla (the main character) and Maddox felt completely real and actually enjoyed reading those parts. I am glad that I read this book and I suggest you read it as well. Also, look for Robin’s other books she has. There are two other books in this series: Fear No Evil and Deliver Us From Evil. These can all be read as stand-alones, so don’t worry about reading them in the correct order. I am looking forward to Robin’s next book, Injustice for All which will be released in January of next year! Note: I received a copy of this book from the publisher in an exchange for an honest review. All thoughts and opinions are mine. Next Inception- The Top: Still Spinning?